While writing about the Skinfood Rose Essence line and wanting to get the lip balms, I remembered I had bought a Deary Rose & Co Q10 Repaired Lip Balm in Hong Kong last year. It was at a local Watson's store, where I found two kinds of Deary lip balms (Rose and Immortelle flower) that looked really nice. I have never heard of this Taiwanese beauty brand before, but the packaging looked so cute that I had to buy one. My chapped, dry lips also needed some nourishment at the time. I couldn't decide between the two for a long time, but ended up buying the one with rose scent, since it is their bestseller product (I always fall for these kind of labels). After taking off the cap, you can see that it has an angled applicator. The lip balm is a pink transparent gel, which can be squeezed out really easily. The scent is mainly minty with a hint of rose. It is very suitable for people that don't like heavy floral scents in their beauty products. There are also other versions of this lip balm with Immortelle flower from Corsica and Pomegranate. From left to right: Juicy lip balm, Repaired lip balm, Moisturizing lip balm, and Tint lip balm. 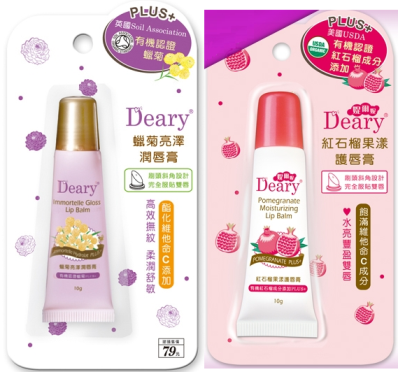 On Deary's website, I also spotted these really cute lollipop jelly tint lip balms. They have a really cool color changing effect. The Cherry lip balm (purple one) turns into a cherry red on the lips. The Strawberry lip balm (pink one) turns into a surprisingly orange color. The Granny Smith lip balm (green one with green apple scent) turns into a pale pink. I really like the paper angel wing attached to the lollipop packaging. The last three pictures were edited by me and promotional pictures from Deary's website were used. The other pictures were taken by me.